SFHA responds to latest Scottish Government housing statistics. 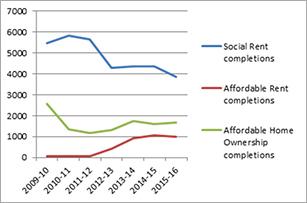 Today’s figures show that, in general, for all tenures – social rent (including housing associations), affordable rent and affordable home ownership – completions are decreasing while approval rates and starts are increasing. Looking at the breakdown, social rent starts and approvals are increasing but completion rates are decreasing. Affordable rent starts, approvals and completions are flat lining. Affordable home ownership completion rates are also levelling out but the statistics show an increase in starts and approvals. “Today’s figures show that the process of increasing housing supply is picking up slowly. Housing association completions are down, but we are pleased to see that starts and approvals have increased which should increase future completions statistics and help deliver the Scottish Government’s 50,000 affordable homes target. 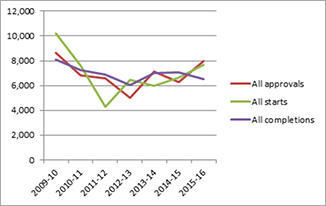 This reflects the fact that housing grant rates were cut in 2009 and 2011 and then increased in 2013 and again in 2016 – it takes time for supply levels to build. 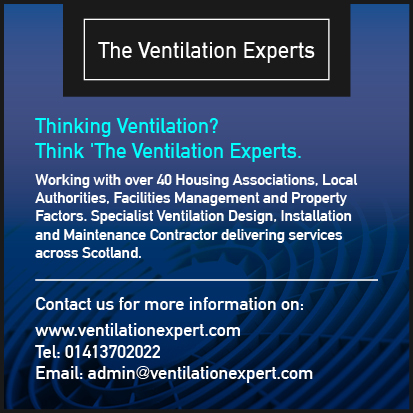 “The SFHA is working hard with members, Scottish Government and other partners to help deliver an increased supply of affordable homes. More homes will not only help solve Scotland’s housing crisis but improve people’s life chances, create jobs, and have a beneficial effect on health and wellbeing. 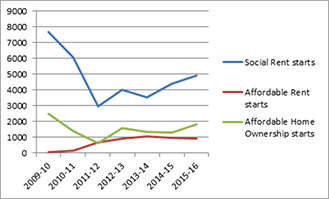 Social rent includes housing association rent, council house rent as well as home owner support fund rent. Affordable rent includes mid-market rent (MMR), National Housing Trust (NHT) Rent as well as other programmes such as the Empty Homes Loan Fund (EHLF) and Rural Homes for Rent (RHfR). Affordable home ownership includes open market shared equity (OMSE), new supply shared equity (NSSE), shared ownership (LCHO) as well as other programmes such as Home Owner Support Fund Shared Equity. 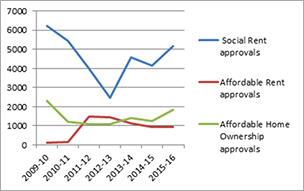 Graphs created by SFHA using Scottish Government statistics.